Microsoft has been working toward a photocopier-size device that would replace data centers by storing files, movies, and documents in DNA strands, which can pack in information at mind-boggling density. All the information stored in a warehouse-size data center would fit into a set of Yahztee dice, were it written in DNA. The National Intelligence Agency’s IARPA program is getting ready to hand out tens of millions toward radical new molecular information storage schemes. Nature Science Reports Abstract Synthetic DNA has emerged as a novel substrate to encode computer data with the potential to be orders of magnitude denser than contemporary cutting edge techniques. 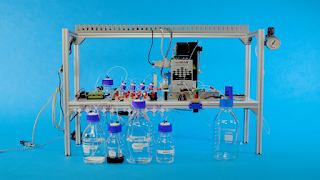 However, even with the help of automated synthesis and sequencing devices, many intermediate steps still require expert laboratory technicians to execute. 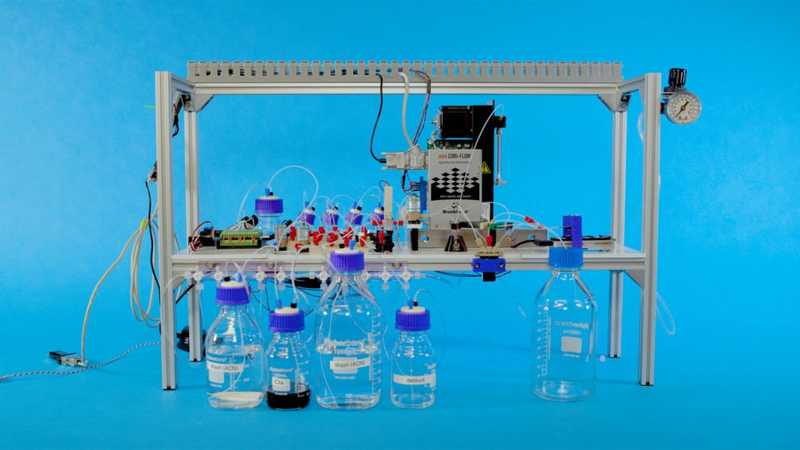 We have developed an automated end-to-end DNA data storage device to explore the challenges of automation within the constraints of this unique application. 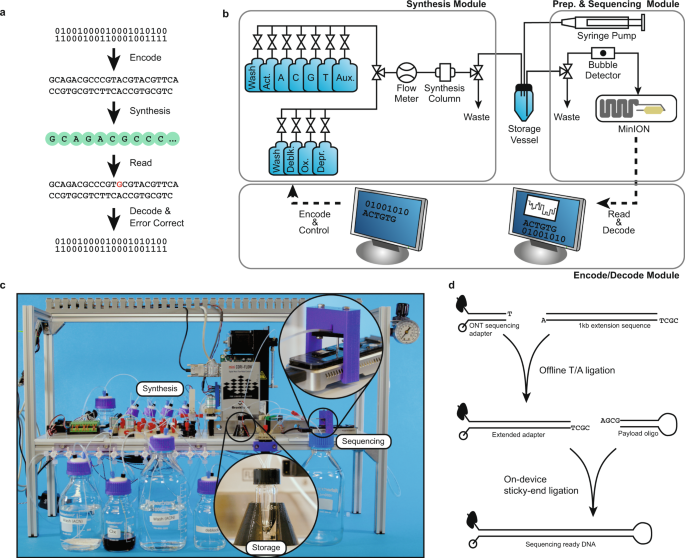 Our device encodes data into a DNA sequence, which is then written to a DNA oligonucleotide using a custom DNA synthesizer, pooled for liquid storage, and read using a nanopore sequencer and a novel, minimal preparation protocol. We demonstrate an automated 5-byte write, store, and read cycle with a modular design enabling expansion as new technology becomes available.
) for most positions, with increased deletions toward the 5′ end due to increased steric hindrance as strand length increases11. Literature suggests a nanopore error rate near 10%9,12, so we also performed a synthesis-to-sequencing error rate analysis on an 89-mer hairpin sequence, encoding “HELLO” in its first 32 payload bases. Figure 2b shows the read error when aligned to the extended adapter and payload sequence. Bases −60 to −1 were directly PCR-amplified from the lambda genome and given a good baseline for nanopore sequencing fidelity under our conditions; bases 0 through +40 come from the payload region and characterize the total write-to-read error rate. The complex combination of these errors — especially deletions and read truncations — causes many strands to be discarded before a decoding attempt is made. Indeed, of 25,592 reads in this new dataset, 286 aligned well in the −100 to −1 region (score > 400) and contained enough bases to attempt decoding. Of those 251 had uncorrectable corruption, 11 had invalid checksum bases after correction, 8 were corrupted but correctable and of those 3 had hashes in agreement, 16 were perfect reads, and 0 were decoded but contained the wrong message.